This innovative high-rise office block was completed in 2005 and is already regarded as a prominent city landmark on the right bank of the Rhine. The building is over 100 metres high and is located opposite to the Cologne Cathedral, directly on the river bank at Cologne Deutz and in the immediate vicinity of the Koelnmesse exhibition centre. This successful symbiosis of intelligent architecture, easily accessible location, high-tech fittings, state-of-the-art building technology and intelligent services makes the KölnTriangle so unique – see for yourself.In Cologne people are already talking about the most attractive view of the cathedral. 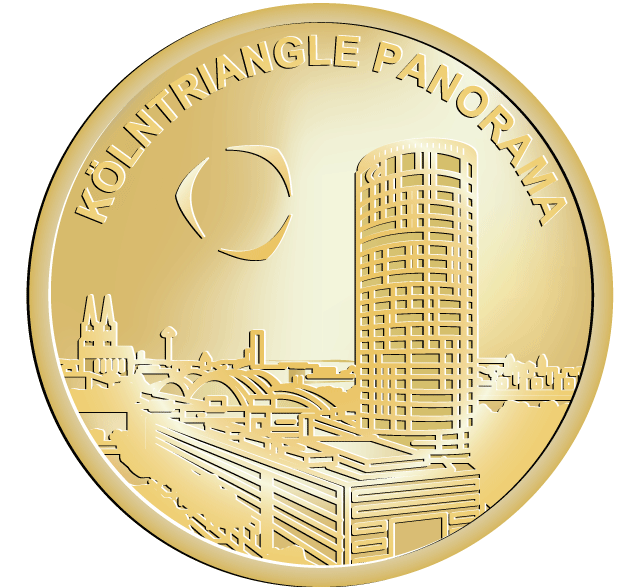 The public panorama platform on the roof of the KölnTriangle offers a breathtaking view of the cathedral city, the Rhine, bridges and the surrounding area.